You can now easily share multiple 360 photos without getting stuck uploading them one by one, if you use Kuula 360 photo sharing platform. 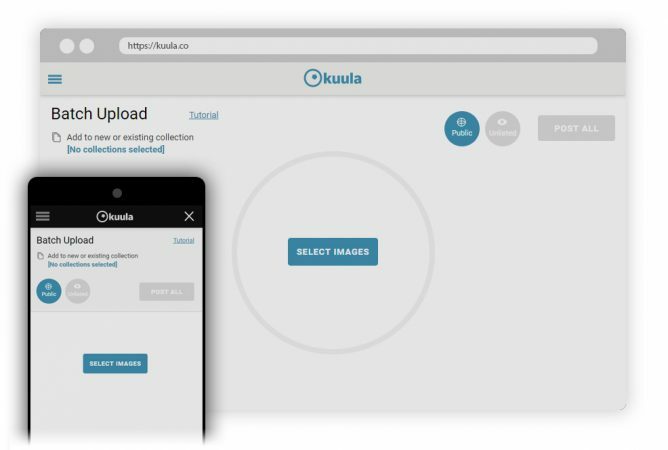 Kuula has just added a new feature: batch uploading of 360 photos. Kuula is one of the most popular 360 photo sharing platforms. They have distinguished themselves from other photo sharing sites by constantly adding new features. The latest one is batch uploading. I got to try out this feature the other day, which I used to upload the sample photos from the Detu F4. It was straightforward and there were no hiccups. BTW, this feature works on either desktop or mobile (on a mobile browser – no app needed). After logging in, simply tap on the upper left corner to bring up the menu, and you’ll see the new Batch Upload option. From the batch uploading screen, you can name the files individually, specify the privacy, and even add the photos to a collection (whether an existing one or a new one). It worked as advertised and is very convenient. Here is the official announcement. Yes and higher resolutions, too! Hi Bill. OK so I spoke to Bartek, the owner of Kuula. He said that they’re allowing uploads of 16K but they will still scale it down to 8K. He said that is the sweet spot, and beyond it there are diminishing returns, so they are not likely to support higher resolutions in the near future. The upload vs display resolution is good to know. For me the increase in upload resolution saved me from having to produce two different files. One high resolution one as an archive and for other sites. And another smaller one for Kuula. Now just one for all. Maybe you could compare the upload and display resolution of the various 360 sites. I wish Kuula would remove the option of showing the camera type. And make it shown all the time. Be so much easier to find and compare different camera’s image quality. Flikr does it so I would think Kuula could too. Thanks Bill. I’ll pass along your suggestion! Hi Bill, thanks for the comments! Do you mean to have the camera info show automatically for photos in the batch upload? It doesn’t show now, but this is something we can certainly fix. Any upload, not just the batch uploads. I think it would be a real service to the 360 community if somehow folks could search by camera. Or at least to just see what camera was used for a particular photo. So yes it should show automatically. Good point. Let me think this through and see what we can do!